Iman seen in a screen shot from a January 10th video, recorded while feeding her in her night quarters. Since December 18th the critically endangered rhino has been kept in her night quarters as staff try to stop bleeding from a tumor in her uterus. She is among nine known Sumatran rhinos on Earth. With just a few dozen hoped to exist in the wild, she is one of the rarest living creatures on the planet. 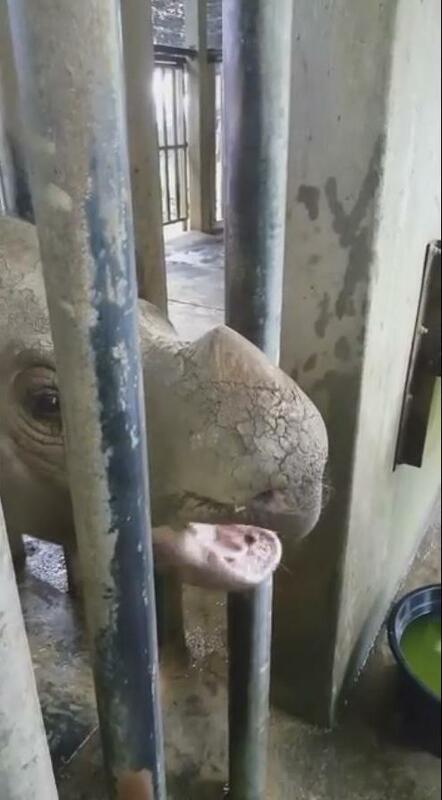 In Malaysian Borneo, officials at the Sabah Wildlife Department and nonprofit Borneo Rhino Alliance have been working around the clock for over a month to save the life of one of the rarest living creatures on planet Earth. 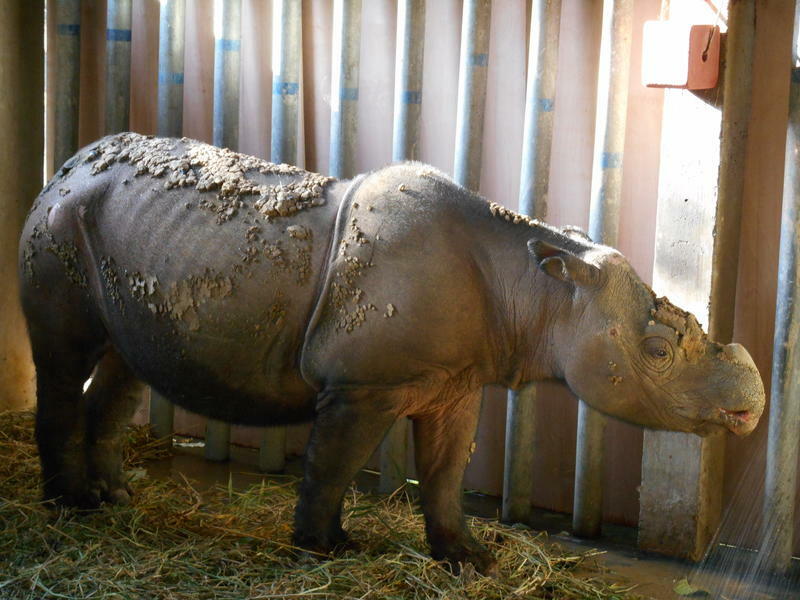 Iman the Sumatran rhino began bleeding from a tumor in her uterus in mid-December at the Tabin Wildlife Reserve. Experts from around the world have been consulted on how to stop the bleeding and determined that the complex procedure, and use of anesthesia, was too risky. Instead, vets are using non-invasive means to treat her in her indoor night quarters. The solitary, mud wallow-loving Sumatran rhino is down to nine captive animals, with just two in Malaysia, and the other seven in neighboring Indonesia. The nonprofit Borneo Rhino Alliance is partnered with the Malaysian government to care for the male and female pair of Sumatran rhinos in Malaysia. We’ve tried to provide updates on her condition each week, and Dr. John Payne of the organization just gave us fresh news. Dr. Payne said things are looking a bit brighter, after a recent sudden increase in blood loss that happened last Friday. He said the senior vet who cares for her, Dr. Zainal Zahari Zainuddin, reported that Iman has spent a month straight in her night quarters now, the longest period for her to be sick since she was captured in the wild in 2014. The doctor noted that since that relapse of excessive bleeding January 12, Iman has been slowing improving. He reported that this week she has had both improved appetite and is vocalizing more, “which are good signs that we watch for”, he said. Iman the Sumatran Rhino squeaks in audio recorded last week. Since starting her on a 200 gram daily diet of concentrates, Iman has been less lethargic and more alert. While she continues to bleed from the tumor in her uterus, the volume of blood is less, and it’s mixed with mucous. The critically endangered animal is hand fed 10-12 kilograms of browse from plants in her jungle enclosure, 6-7 kilograms of fruits like mangos, and 200 grams of horse pellets. She's packed in mud three times a day to keep insects from biting her and to condition her skin. Poaching and habitat destruction have reduced the wild population of Sumatran rhinos to just a few dozen believed to live in the dense jungle of just one spot in the world: the Way Kambas National Park in Indonesia. See a new video of Iman that was shot January 10th and includes her vocalizing. 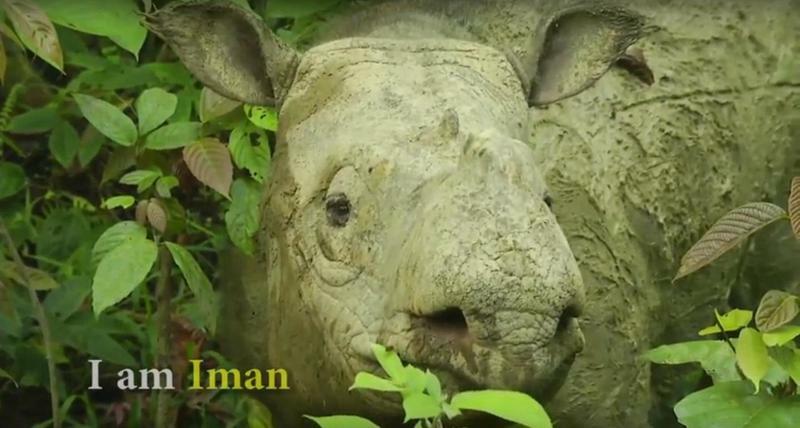 Learn more about Iman and the nonprofit that cares for her, Borneo Rhino Alliance. Today we continue our ongoing series within Helping Hand about the rapidly escalating rhino extinction crisis, a poaching epidemic that has reclassified the rhinoceros as among the most vulnerable animals on earth. 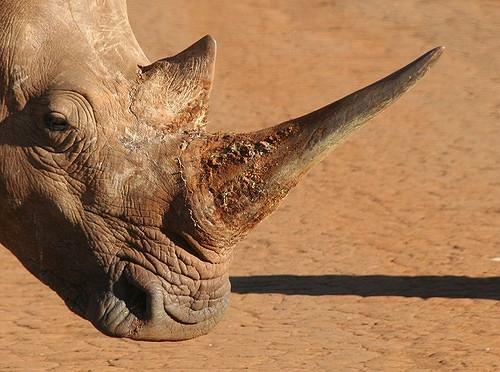 Brutal killings of two to three animals happen every day; without immediate intervention, wild rhinos are forecast to be wiped from the planet, almost entirely due to demand for rhino horn in just two countries: Vietnam and China. 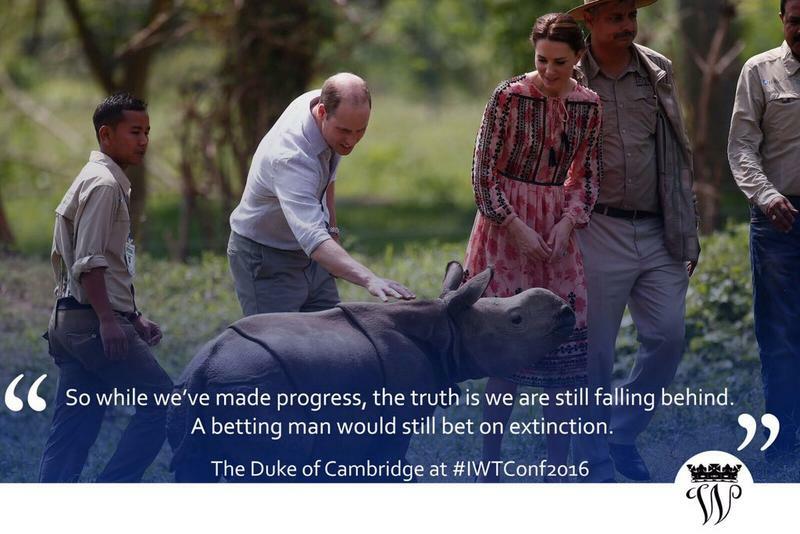 The Duke of Cambridge, Prince William, wrapped up a historic visit to Vietnam where he tried to reach people from across the spectrum with a message to end trafficking and consumption of endangered wildlife. Vietnam is the epicenter of the problem, which has pushed elephants, rhinos, lions, tigers and pangolins to the edge of extinction. After meeting with politicians, school children, traditional medicine practitioners, conservationists and young business leaders, he addressed the third International Illegal Wildlife Trade Conference in Hanoi. You can view it below.